This species is accepted, and its native range is Mexico to Central America. It is used to treat unspecified medicinal disorders. Perennial herb to 1(–2) m. tall; roots tuberous. Leaves ovate or oblong to triangular, to 9 cm. long, apex acute, base cordate; petiole to 4 cm. long. Inflorescences 3–7-flowered; flowers ± sessile, opening in late afternoon, fragrant; involucral bracts ± 1 cm. long; perianth to 6.5 cm. long, 2.5–3.5 cm. wide at the limb, white, pink, red or yellow. Anthocarp subglobose to ellipsoid, 7–8 mm. long, black. Naturalised in cultivation, waste ground and around habitation; 200–2150 m.
Widely cultivated as an ornamental, now established in many parts. Herb up to 1.5 m. tall. Stems glabrescent or pubescent, pubescence often concentrated in longitudinal strips down stem. Leaves ovate, 3.5–13 × 2–8 cm., entire, acuminate, base rounded, truncate or cordate, glabrous to puberulent (particularly along veins above), margins often ciliate, rhaphides usually conspicuous beneath, superior leaves frequently subsessile, inferior leaves petiolate; petioles up to 4.5 cm. long, pubescent along superior surface. Involucre 5–13 mm. long, divided more or less halfway into 5 triangular to ovate, acute to acuminate lobes, glabrescent to pubescent or pilose particularly along margins. Perianth tubular 4–5.5 cm. long, lower portion green, upper portion spreading 2–3 cm. diam., purple, red, yellow, white or variegated. Stamens 5–6, exserted, 2.75–6 cm. long; filaments filiform, united into fleshy cup at base; anthers 1.2–2 mm. long, oblong-ellipsoid. Ovary ellipsoid or ovoid, 1–1.5 mm. long; style 4–6.5 cm. long, filiform; stigma with stalked papillae. Anthocarp ellipsoid to subglobose, 7 – 9 mm. long, ribbed or angled, tuberculate between the ribs (in dried state), hard, black. Alt. 100 - 1780 m.
Naturalizada en Colombia; Alt. 100 - 1780 m.; Andes, Pacífico, Valle del Cauca, Valle del Magdalena. 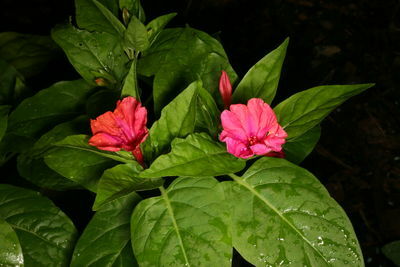 Mirabilis cordata Brouss. ex Roem. & Schult. Mirabilis jalapa subsp. ciliata Standl. 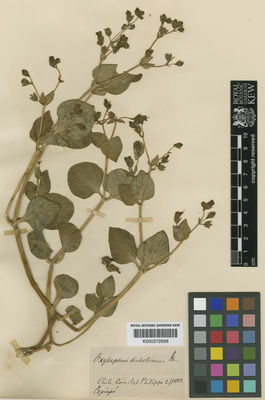 Mirabilis jalapa subsp. lindheimeri Standl. 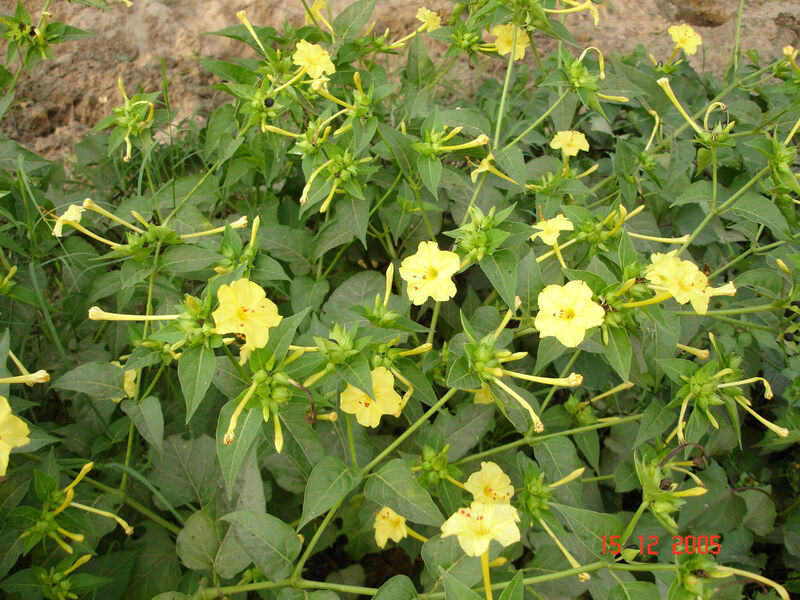 Mirabilis jalapa subsp. volcanica Standl. Mirabilis pubescens Zipp. ex Span. Buenas tardes, dondiego de noche, tabaquillo, flor de tarde, maravilla, jazmín de tarde, jalapa. von Raab-Straube, E. & Raus, T. (eds.) (2019). Euro+Med-Checklist Notulae, 9 Willdenowia 48: 195-220. Struwig, M. & al. (2015). Nyctaginaceae: A taxonomic treatment for the flora of Namibia Phytotaxa 238: 101-135. Cruz Durán, R. & al. (2014). Flora de Guerrero 63: 1-86. Facultade de Ciencias, UNAM. Greuter, W. & Raus, T. (2011). Med-Checklist Notulae, 30 Willdenowia 41: 311-328. Whitehouse, C. (1996). Flora of Tropical East Africa, Nyctaginaceae: 1-20. Heine & Legère, Swahili Pl. : 174 (1995). Agnew, A.D.Q. & Agnew, S., Upland Kenya Wild Flowers, ed. 2: 84 (1994). Thulin, Fl. Somalia 1: 169 (1993). Stannard in Flora Zambesiaca 9(1): 13 (1988). Troupin, Fl. Rwanda 1: 203 (1978). E. Lind & A. Tallantire, Some Common Flowering Plants of Uganda, ed. 2: 107, fig. 56 (1971). Keay, Flora of West Tropical Africa, ed. 2, 1: 178 (1954). Balle in Flore du Congo Belge et du Ruanda-Urundi, 2: 90 (1951). F. W. Andr., The Flowering Plants of the Anglo-Egyptian Sudan 1: 152 (1950). R. O. Williams, Useful and Ornamental Plants in Zanzibar and Pemba p. 354, fig. on p. 355 (1949). A. Engler & O. Drude, Die Vegetation Der Erde, IX, Pflanzenwelt Afrikas 3(1): 134 (1915). T. Cooke in Fl. Cap. 5(1): 393 (1910). Baker & C.H. Wright in Flora of Tropical Africa 6(1): 2 (1909). Rendle in Journal of the Linnean Society of London, Botany 37: 201 (1905). Engl. in Die Pflanzenwelt Ost-Afrikas und der Nachbargebiete, Theile C: 174 (1895). L., Sp. Pl. : 177 (1753).